I just wanted to let you know that I was hired and I start with Unum the end of this month. It is a great Remote position and I was offered even more $$ than what was offered. Thank you for the great work you do! – Andi M.
Thanks to your blog and receiving weekly emails from you, I was able to be hired by Enterprise/National/Alamo, and stayed there for 6 months. I was a phone customer service agent there, and I greatly prefer chatting, so I found a job posting with Percepta for a Ford Chat Agent, and I was hired there and just started training this week! Thanks RRR! I just got hired as an online English teacher for adults worldwide by Education First/start in January, have been working as a Rev Captioner for 8 months, and just earned $75 for taking a 45-minute online chat survey from 20/20 Panel, which I used for a VISA debit card. LOVE your site! – Linda H.
I wanted to thank you. With your help I got hired with American Express as a Virtual Travel Consultant. Thank you for what you do. You’re making dreams come true. – Nadynem A. Thanks for your daily email and I am happy to share that I got a job offer today from Support.com as a remote service technician. I accepted it and my training starts next year. My interviewer asked me how I found their job opening and of course, I told them that I got the information from your website. Support.com had a quick turnaround in getting back to me. I finished my application last 17th of December, set my interview for today and got a job offer right before the interview ended. Thanks for collating all relevant websites that offer work at home opportunities. – Bruce D.
[Hyatt] hired me Dec. 1 and the company offers a lot of really nice perks! Thank you for the lead. I will update you how they are to work for after I am finished with training. – Jaquie K.
I have been looking for a WFM opportunity since my last one ended for months. Now I have two jobs from RRR. I’ve been working for NexRep for about a month and I just started a position with Tutor.com as well! You guys are awesome! – Jessica P.
I got hired with Working Solutions! I start Jan 7th. – Krissy S.
Hi RRR’ (roaring, racing; ready! ): I sooooo love y’all (yerp I’m from Chicago/Mpls- turned Texas 😂🤣🤦)! I’m very long winded but I know y’all are very busy… That said, I landed two (2) gigs – non-phone – in two days! CastingWords Transcription (they are too awesome) AND Babbletype – transcription as well (they too are awesome sauce!). There are audio transcribing exams to pass. However, anyone who has a listening ear, the ability to “enlist” correct grammar, etc., and other obvious necessities should fare well! I got Hired! Thanks to you! Lionbridge has offered me a P/T rater job. So excited to start! Thanks again. – Patrice B. Thanks to RRR I was just hired for Sedgwick full time !! – Ashley K.
Thank you, RRR! I was hired full-time with Sedgwick. Today was my first day of training. – Allison K.
Thanks to Rat Race Rebellion, I learned about captioning for Rev and I applied and… I just got accepted to do captioning for them! I’m so excited to get started! 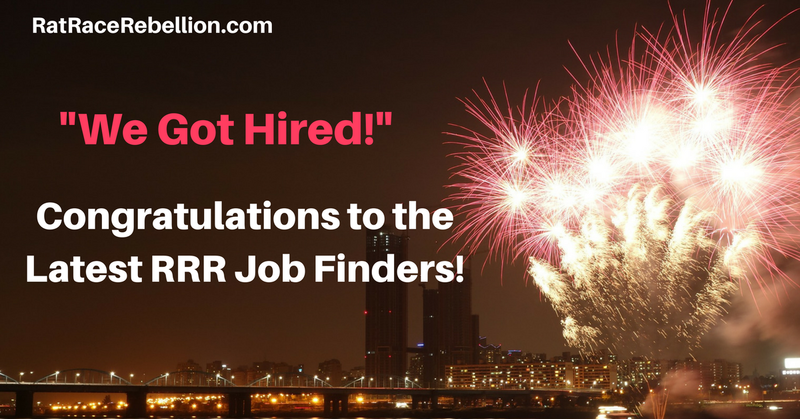 RRR, you’re a tried and true source about finding real work from home opportunities. I appreciate you guys! – Meredith K.
Got hired with Rev thanks! – Yalawa Q. J.
TY TY TY for the work you do to narrow down legitimate positions and weed out all of the scammers that post WAH jobs. I just accepted a job at Humana thanks to a link in one of your emails! Thank you for the prosperity you just provided to my 2019! – Angela S.
Got hired with MaritzCX! Thank you for your post. – Kelsie D.
I was hired for Concentrix Remote Customer Service Associate thank you. – Arniecia H.
I got a job with Working Solutions!!! Thanks so much RRR!!!! – Jacquee A. Just accepted a position with Conduent and I’m thrilled! Just when I felt like there was no hope coming from maternity leave my former co-worker introduced me to your website! Thank you so much. There are so many great opportunities available and I’m glad I came across one. – Jernise G.
Thanks to you guys and the leads you provide I am now a Working Solutions independent agent. I got my job offer today for the program that I was interested in. I really appreciate the hard work you guys put in to make it easier for us [email protected] job seekers!! Thanks a million!! – Jeree R.
I’ve been hired through NexRep! Thanks for always having vetted leads for work at home jobs. – Heather A.
I’m officially part of the Rev family!!! I read one of your articles about the freelance work Rev offers, and applied. I also read the comments from RRRebels they hired, and they all stated the same thing – READ THEIR STYLE GUIDES! I did just that and completed the application process and now I’m part of the team. Keep up the great work you all are doing. The information you all are providing is priceless. – Martine F.
I just wanted to say thank you for creating an amazing site! I was just hired with Rev as a captioner! I would have never found the job if it wasn’t for your emails. Thank you so much. – Haley G.
So excited!!!! I got the job with Kelly Connect chat agent!!! Whoohooo hip hip hooray!!!! Lo.l I’ve been trying to get this job for the past year and after applying for the 3rd time I finally made it all the way up.! Lol, thanks! – LaQuetta S.
Hey, thanks to Rat Race Rebellion I have been hired by U-Haul as a Sales and Reservations Specialist! I start orientation tomorrow 01/14/19! Many Thanks! – Brandie B.